Color Building photograph by Randy Simes for UrbanCincy. It’s not even close to being one of the biggest corporate relocations in town, but for Over-the-Rhine it could be a game-changer. Core Resources Inc., a fast-growing Anderson Township construction management and development company, is pulling up its suburban stakes and moving 31 employees to the Color Building at 14th and Vine streets. It’s goodbye to four-minute commutes, hello inner city. Core joins many other, generally smaller, businesses that are migrating back to Over-the-Rhine. Two law firms, Keating Muething & Klekamp and Barron Peck Bennie & Schlemmer, have opened satellite offices this year. Other recent arrivals include Four Entertainment Group, the operator of Keystone Bar & Grill and other urban eateries, which just moved from Mount Adams; Northpointe Group, a real estate development company; and the Brandery and other startup-related ventures. If other businesses follow Core’s lead, it could mean that Over-the-Rhine’s decade or so revitalization is entering a whole new phase. Nobody seems to keep count, but Core looks to be the largest for-profit business to move into Over-the-Rhine within recent memory. Many businesses are attracted by nearby clients, including Cincinnati Center City Development Corporation (3CDC), but for decades almost any movement by private business was in the other direction – out. Barron Peck moved into a rented storefront on Vine Street in September, just a few doors down from Core’s soon-to-be new headquarters. Businesses are definitely part of OTR’s master plan, and there are many buildings suitable for larger commercial users, said 3CDC spokeswoman Anastasia Mileham. Scott Stiles, the city of Cincinnati’s assistant city manager, said Core’s CEO Paul Kitzmiller approached him months ago, and he assured Kitzmiller the city would work with him. “It’s important that a company like his is willing to look at Over-the-Rhine. Hopefully that validates some of the investment we’ve made down there. It’s certainly gratifying,” Stiles said. Core is getting a tax break from the city – an investment reimbursement based on 55 percent of the earnings taxes paid by its employees for five years. It’s worth an estimated $114,000, still to be approved by City Council. Not that Core Resources is venturing into unknown territory. 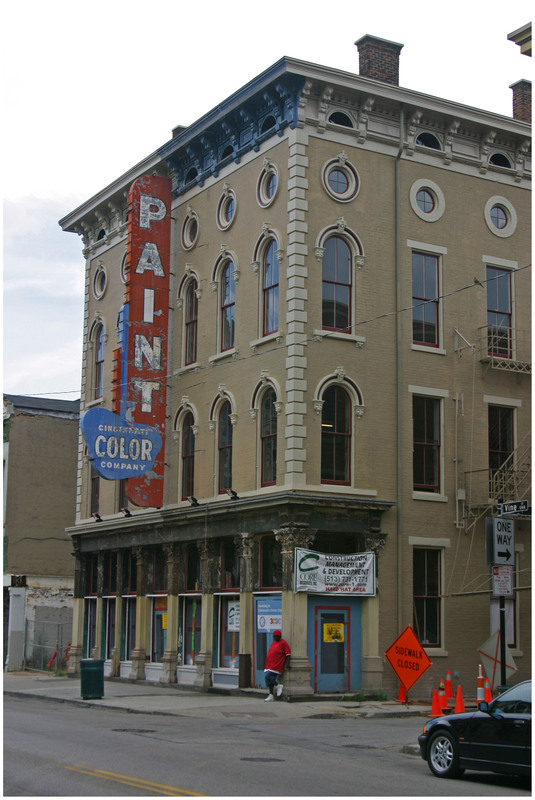 It has worked on many downtown restaurant projects, and for the past year it’s been renovating the Color Building for 3CDC, now its landlord. “The more we got involved with the project and got to know this building, we saw how special it was,” said Kitzmiller, who is co-owner of Core with his brother Dave Kitzmiller, its chief operating and financial officer. This story was originally published in the December 7, 2012 print edition of the Cincinnati Business Courier, and was written by Jon Newberry. UrbanCincy readers are able to access this story in its entirety through our exclusive partnership with the Business Courier. Those interested in accessing all of the Business Courier‘s premium content can do so by subscribing through UrbanCincy‘s discounted rate.